It’s getting to the point in my like whereby a few of my musical heroes are passing on to that great gig in the sky. The most recent loss being the greatest exponent of his instrument, Jon Lord. I didn’t know the fella, but all the interviews I’ve read over the years in the likes of Sounds, Kerrang!, and more recently Classic Rock, he always came across as an absolute gent, when quite a few come over as complete arses. He was present at my first ever gig, Whitesnake at Deeside leisure Centre in 82. 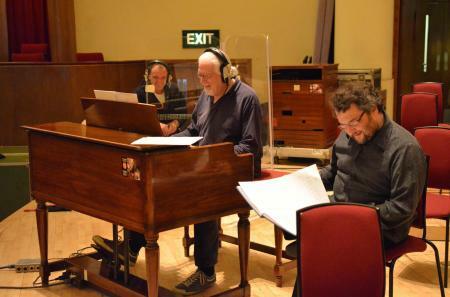 He wrung the neck off that frigging Hammond organ, and a love story was begun….Happy days! Right at the dawn of Deep Purple, Lord wanted to express his Classical tendencies with ‘April’, but the highlight for Purple fans was when Jon and Ritchie used to fight it out note for note. I always feel he was wasting his talents in Whitesnake, but I suspect it paid the bills. Just before he died, I was watching the same (original) Deep Purple concert on the telly, and yes it looked dated, but it was an absolute joy to watch. Here we are some 43 years later from the original release. ‘’Over these last years since leaving Deep Purple. I’ve played it over 30 times with different orchestrations and conductors all over the world, and, of course, in 2000 I did it well over 30 times with Purple on the Concerto tour, so I’ve been honing the piece live on stage, and I’ve had the opportunity to change things on the score that weren’t sounding quite right. 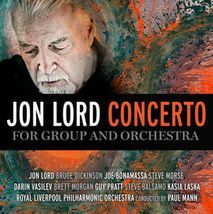 It is therefore a marvellous and exciting prospect to have the definitive recording of the definitive version of the score’’ Jon Lord, May 2012. He recorded the rhythm section – Guy Pratt (Floyd, Madonna) & Brett Morgan (Jon Anderson, Sting) and the Royal Liverpool Philharmonic Orchestra in June 2011 in Liverpool – conducted by Paul Mann. Production then moved to Abbey Road Studios to record Maiden’s Bruce Dickinson (on vox with Steve Balsamo and Kasia Laska) and Joe Bonamassa, Darin Vasilev (who played all the guitars in the first movement) and Steve Morse on Guitars. Wow! The original score was lost in 1970, and it was performed again in 1999 with a recreated score. Dutch composer Marco de Goeij had the unenviable task of recreating the score by listening to the recording and watching the video of the 1969 performance. Just hearing the final version is enough to make a grown man cry. All the artists make great contributions to the piece. Lord is one of the few people who make his Hammond sound meaner than a guitar and truly has a trademarked sound. This version is the one he wanted us all to hear.